You can easily edit a page to collaborate on group projects or assignments. Note: Your instructor may also allow you to edit course pages. Pages is designed to open to the front page for a course, if there is a front page selected. 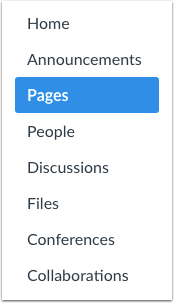 Click the View All Pages button to select a page from the Pages Index. Click the title of the page you wish to change. Click the Edit button to make changes to the page. Previous Topic:How do I edit a course page as a student? Next Topic:How do I delete a page in a group? Table of Contents > Pages > How do I edit a page in a group?